Page 14 of The Mythic Roots of Western Culture’s Alienation from Nature. Adams and Belasco. Tapestry Institute Occasional Papers, Volume 1, Number 3. July, 2015. Outline / List of Headings available here. The boundary that separates the landscape of Ruthless nature from that of Idyllic nature in The Epic of Gilgamesh is geographical. It runs through the watering hole where Enkidu experiences first contact with the people of Uruk (Figure 3). But the boundary between Ruthless and Idyllic nature is also psychological, dividing the psyches of Enkidu and Gilgamesh. This is extremely significant because the two men are introduced and defined as complementary halves of a whole person. a man who equals his stormy heart. Gilgamesh is 2/3 god and 1/3 human; Enkidu is the reverse, 1/3 god and 2/3 human. Gilgamesh not only lives in Uruk but is responsible for building it; Enkidu lives in the Idyllic wilderness where he grazes alongside gazelles. Gilgamesh takes the women of Uruk so frequently it’s creating serious problems; Enkidu’s first act when he gets to Uruk is to protect a woman from Gilgamesh, which starts a fight. The men are opposites yet do not represent a simple dualism of good and evil. “Gilgamesh is a tyrant, but he is also magnificent. . . Every negative about him is balanced by a positive. Of course, from another perspective, it is clear that the whole world of Uruk is out of balance because of Gilgamesh’s manic excesses and that Enkidu has been created to restore that balance.” (65) Enkidu can do that because he is Gilgamesh’s opposite, and the place that’s most apparent is his relationship to nature. his locks billowed in profusion like Ashnan. but wore a garment like Sumukan. as with animals, his thirst was slaked with (mere) water. 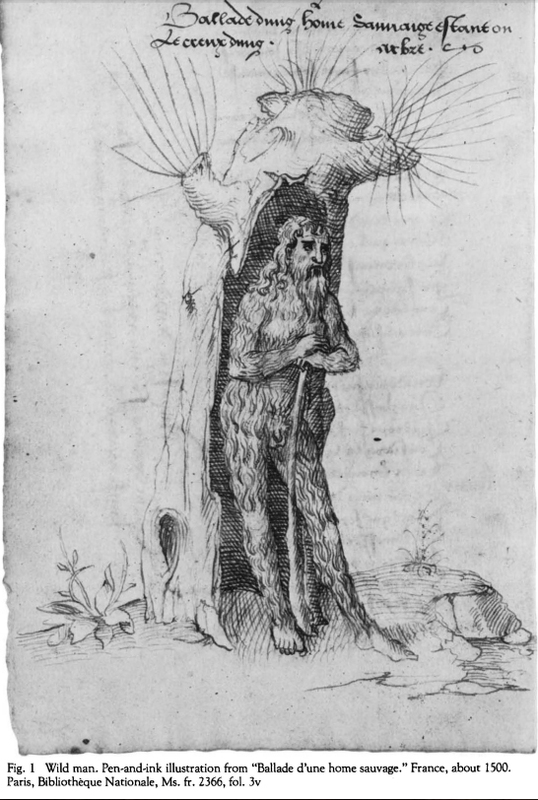 Drawing of a Wild Man from a French manuscript dated about 1500. This figure represents the same aspect of the Western psyche that was first represented 3500 years earlier by Enkidu. From “The Wild Man: Medieval Myth and Symbolism,” Catalog of an exhibition held at the Cloisters, Metropolitan Museum of Art, Oct. 9, 1980-Jan. 11, 1981. See ref. 67. This is a view of Enkidu as prototypical Wild Man, an archetype that was later prominent in Medieval European folk tales and stories. Scholars consider the European Wild Man a sublimated projection, a person who embodied the “chaos, insanity, and ungodliness” Medieval society strove to rise above (67). Yet it’s clear Medieval Europeans weren’t the first people in Western culture to be fascinated and frightened by the idea of a man who’s more animal than human. In this story that predates Medieval Europe by 3500 years, the trapper who makes first contact with Enkidu is terrified: “. . . rigid with fear; though stock-still. his heart pounded and his face drained of color.” Even worse, the frightened trapper discovers that Enkidu has “filled in the pits that I had dug, wrenched out my traps that I had spread, released from my grasp the wild animals. He does not let me make my rounds in the wilderness!” The trapper’s father suggests a solution that expresses a prime motif of Western culture’s relationship to nature: to set up a situation whereby Enkidu’s “animals, who grew up in his wilderness, will be alien to him.” (68) In other words, shut Enkidu out of the Best Friends relationship with nature so he won’t feel compelled to protect animals from the trapper any more. The trapper’s complaint and this specific strategy to address it demonstrate that the key functional difference between Enkidu and the people of Uruk is their conflicting views of nature. The trapper’s plan works and Enkidu does wind up alienated from the animals. This automatically moves him from the Best Friends to Animals Only motif of Idyllic nature. But — by definition — there’s no place for Enkidu or any other human in an Animals Only world. So he leaves the watering hole and goes to Uruk. When he does, he crosses the boundary between Idyllic and Ruthless views of nature (shown schematically in Figure 3). This is an extremely important psychological event. The San Andreas Fault in California illustrates the magnitude of the boundary between Idyllic and Ruthless views of nature that Enkidu crosses in The Epic of Gilgamesh. The land colored red is the part of California that is still attached to the rest of North America but has over-ridden the plate boundary and is now moving northward on other currents. This land is being torn off of the rest of North America at the over-ridden plate boundary, marked by the San Andreas Fault. The significance of crossing this boundary can be represented by a real landscape. Most of the North American continent is being rafted westward by currents in the earth’s mantle, a layer beneath the crust. But the rocks of the Pacific Ocean floor are rafting northward on different currents in the mantle. Part of the North American crust has been shoved across the boundary between the two plates; it’s shown in red on the diagram to the left. You can understand this situation by imagining how a suitcase at an airport inspection gate rolls off the end of the conveyor belt that’s carried it through an X-ray machine. When the front of the suitcase reaches the end of the conveyor belt, it’s still shoved from behind and so slides over onto the fixed shelf beyond. 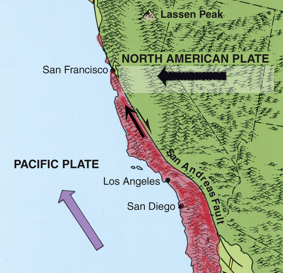 The part of the North American crust that makes up most of western California has been shoved west right over the Pacific Plate boundary this way. But instead of simply landing on a fixed shelf, that piece of crust winds up on a different conveyor belt that’s moving northward. Because the part moving north is still connected to the larger part that’s not moving north, the two pieces get torn apart. The episodes when the rocks tear apart are earthquakes and the boundary where the tearing happens is the San Andreas Fault. This is the magnitude of the boundary Enkidu crosses when he travels from the watering hole to Uruk. The views of nature in those two places are so fundamentally and diametrically opposed that Enkidu changes from a man who releases trapped animals to one who intentionally kills a sacred bull. Every aspect of his identity, including his ethical system, cannot help but suffer wrenching stress as he travels to Uruk. Once there, Enkidu’s destruction is as inevitable as is the eventual severing of western California from the North American continent (69). So why does Enkidu change? After all, his first encounter with Gilgamesh is a fight. They meet as opponents, not friends. The key to understanding what he does after that is remembering the reason Enkidu was created to begin with: as “a double for Gilgamesh, his second self, . . . let them balance each other perfectly, so that Uruk has peace.” Enkidu is not a “real” human being in his own right, but was specially created to bond with and balance Gilgamesh. That is: Gilgamesh is the story’s Hero and Enkidu only exists to support him. His whole reason for being is to bring Gilgamesh the things this out-of-control king lacks, bond with him, and thereby balance him. 65. Stephen Mitchell translation. From Stephen Mitchell. 2004. Gilgamesh: A New English Version. Free Press, A Division of Simon & Schuster, Inc. New York, NY. pages 10-11. 67. Timothy Husband. 1980. “The Wild Man: Medieval Myth and Symbolism.” Catalog of an exhibition held at the Cloisters, Metropolitan Museum of Art, Oct. 9, 1980-Jan. 11, 1981. Published by The Metropolitan Museum of Art, New York. pages 2, 3, and 10. 69. One of the most readable explanations of plate tectonics, geologic features and processes of western North America, and significance of the San Andreas Fault can be found in John McPhee. 1981. Basin and Range. Farrar, Straus, Giroux, New York.